Follow the countdown and launch of a Boeing Delta 2 rocket with NASA's Genesis solar wind sample return probe. Reload this page for the very latest on the mission. 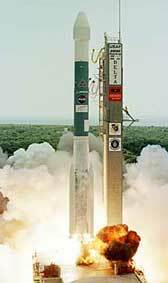 The Delta 2 rocket lifts off with Genesis. Photo: Carleton Bailie for Boeing. Ground track - Trace the Delta rocket's trek during launch. Launch windows - See the daily launch opportunities for Genesis. Delta 2 rocket - Overview of the Delta 2 7326-model rocket used to launch Genesis. Genesis - Technical look at the spacecraft and its systems. Mission science - Overview of the scientific objectives of Genesis.